An ESF alumnus who helped develop a vaccine that was hailed as one of the most important advances in pediatric medicine has received the nation’s highest honor for technological innovation. 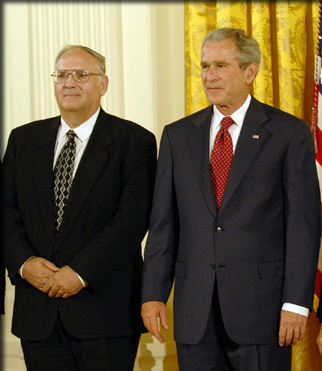 The National Medal of Technology was bestowed upon Ronald Eby by President Bush at the White House July 27. Eby, who studied chemistry at ESF, was part of a team that developed a vaccine, called Prevnar, that has reduced by up to 75 percent the number of ear infections, and cases of pediatric pneumonia and meningitis caused by the Streptococcus pneumoniae bacteria. It is the first vaccine to prevent the consequences of infections from the bacteria. “It is a rare opportunity for a researcher to apply basic research to a product that can have such an impact on human health,” he said. Eby’s work in the field began in 1965, when he enrolled at ESF as a chemistry major. “I was interested in medicine, especially in medical research. I got hooked on carbohydrate chemistry because of the medical possibilities,” he said. Eby went on to receive his master’s degree and his doctorate at ESF, then went to work with Praxis Biologics in Rochester, where the vaccine was developed. It took nearly 11 years of clinical trials to prove the safety and efficacy of the vaccine. Most vaccines trick the immune system into acting as if an infection is present, even though it is not. Then when the person is exposed to that illness again, the immune system is already activated and ready to combat it. Eby had to find a substance that would stimulate a strong enough immune response in the immature system of an infant to safeguard from future infection. Existing vaccine technologies used the outer coat of bacteria to trigger an immune response from the body. Eby used this approach but linked a protein to the bacteria's outer coat that could be recognized by an infant's immune system. The catch was that S. pneumoniae comes in seven main forms, so Eby had to create a separate compound for each of these and roll all of them into one seven-part vaccine. Eby’s team has received other honors for the Prevnar work, including the 2005 Discoverer’s Award from the Pharmaceutical Research and Manufacturers of America and the 2003 Heroes of Chemistry Award from the American Chemical Society.